The ocean like an eagle. It is better to be together. 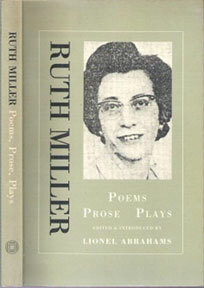 Ruth Miller was a South African poet, born in 1919 in Uitenhage. She grew up in the northern Transvaal and spent her adult life in Johannesburg, working as a school secretary and later an English teacher. The accidental home death by electrocution of her son, aged 14, clouded the last six months of her life; she produced nothing for some time, and subsequently wrote some of her finest work. She died of cancer in 1969. More HERE. This entry was posted in poetry and tagged apartheid, Ruth Miller, south africa. Bookmark the permalink.